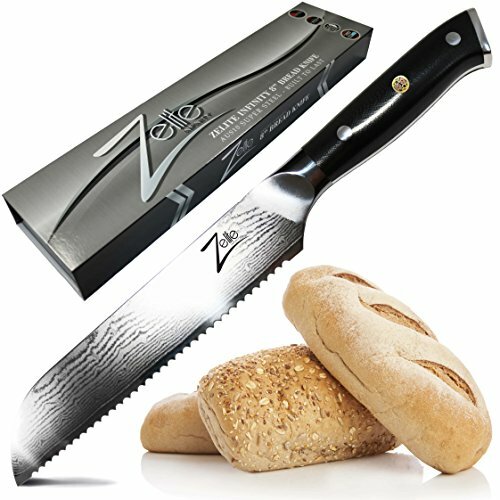 ✅ SETTING THE NEW STANDARD IN BREAD KNIVES >>> Impress Guests with your Visually Stunning, Extreme Performance 8-inch Slicer Knife - Tomato Knife adding Refinement and Style to any Modern Kitchen! Minimal Slicing Resistance, Satisfying Heft, Full Tang & Highest Quality Materials. Set in a Premium Packaged Box, Value-for-Money Never Looked So Good! ✅ 100% SATISFACTION or MONEY BACK GUARANTEE - TRY IT RISK FREE >>> Lifetime Warranty against Manufacturing Defects (only if purchased direct from 'Zelite Infinity' - check item is "sold by Zelite Infinity"). Our Bread Knifes have been built with Perfection in Mind. Ideal Multipurpose Cutlery Gift (Christmas, Wedding, Birthdays, Fathers Day, Mothers Day), for Home Cooks, Professional Chefs, Culinary Students and more. You can't lose. Limited Supply, Order Now before they are Sold Out!